WATERTOWN - The St. Paul girls basketball team improved to 17-2 for the season, claiming its 12th straight victory with a 58-48 win at Watertown on Tuesday night. 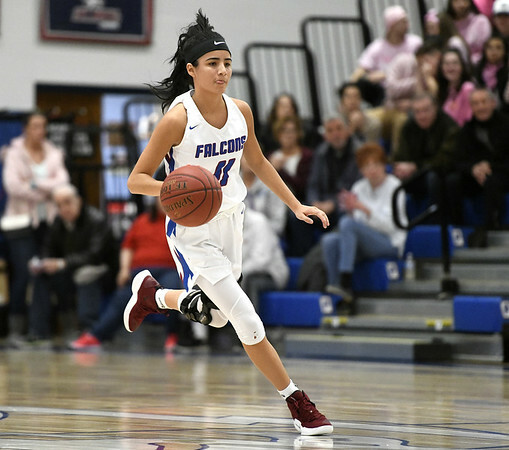 The Falcons, who led 32-12 at halftime, were led by a 30-point night from Janessa Gonzalez, along with 11 points from Jade Udoh, eight from Emma Cretella and five from Morgan Kolb. Watertown (11-7) was led by Jordyn Forte’s 23 points. Bristol defeats Bulkeley/HMTCA: There were 26 best times recorded by Bristol co-op swimmers in a meet at the Malone Center in Bristol on Tuesday. Bristol, which improved to 5-1 with the win, got first place finishes from Colton Litwinczyk in the 200 freestyle, Gabriel Bartolome in the 200 IM, Joshua Mitchell in diving, Mikel Palaj in the 100 butterfly, Noah Taylor in the 100 freestyle, Adam Losacano in the 100 backstroke and Lewis Sinche in the 100 breaststroke. The 200 freestyle relay of Ben Stafford, Jake Mendocha, Jack Alling and Sinche and the 400 freestyle relay of Palaj, Stafford, Bartolome and Litwinczyk also won their events. Palaj in the 100 butterfly and Sebastian Rutkowski in diving qualified for state competition. ST. PAUL: Kailyn Bielecki 0-2-2, Olivia Heslin 1-0-2, Emma Cretella 3-0-8, Janessa Gonzalez 8-13-30, Catherine Ciampi 0-0-0, Morgan Kolb 2-1-5, Jade Udoh 4-3-11. Totals: 18-19-58. WATERTOWN: Jordyn Forte 9-5-23, Nicole Defeo 2-2-6, Alyssa Santangeli 3-0-6, Chloe Defeo 1-7-9, Marissa Forino 1-2-4. Totals: 16-16-48. Three-point goals: Cretella (SP) 2, Gonzalez (SP). Records: St. Paul 17-2, Watertown 11-7. Posted in The Bristol Press, Bristol Central, Bristol Eastern, St. Paul on Wednesday, 6 February 2019 18:19. Updated: Wednesday, 6 February 2019 18:21.